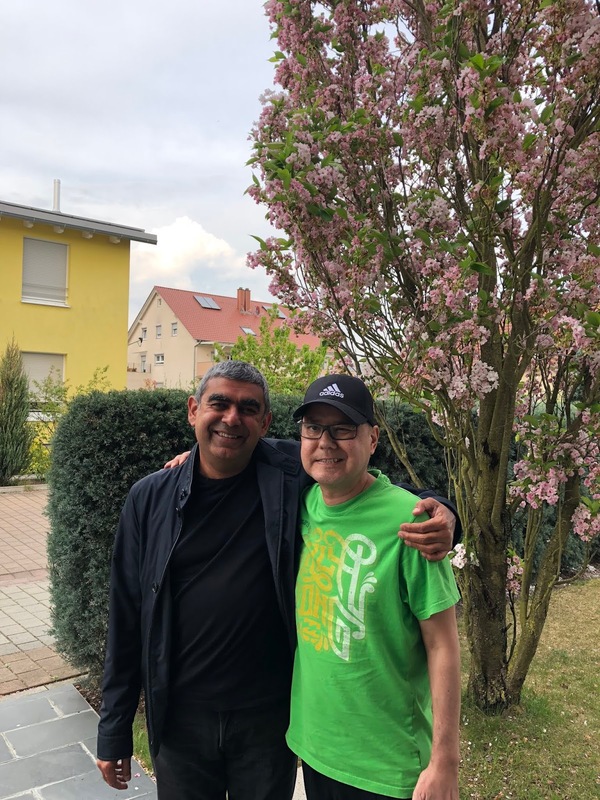 My friend Daniel Schneiss passed away earlier today, peacefully in his sleep at his home in Germany. The world lost an extraordinary young man, a loving husband, an amazing father, an incredibly accomplished professional and a wonderful human being. His last couple of years were anything but peaceful, full of pain, suffering and adversity that a devastating multiprong cancer can bring. And yet Daniel was peaceful, calm, serene, and full of determination, grit, an unyielding will to never give up, a passion for life and for doing the right thing. In his actions during this fight to death, he showed what it means to live, to not give up, to be giving in our suffering, to be caring in our pain. I found myself in Germany a few weeks ago, and went to see him, his soulmate Judith and their son, for a moving, and exhilarating couple of hours. This picture is in front of his beloved cherry tree, just past the peak blossom, entering a stage he told me, true to his part-Japanese heritage, is called Hazakura, when the Sakura transition to young leaves on the trees. He was full of life that day, and Judith was happy too, there was much laughter, some tears, great joy. On the drive back, however, I found myself devastated as I reflected on an amazing man’s incredible young life. I first met Daniel about 16 years ago. Building on Jim Gray’s research in mapping strings to integers to reduce storage for data cubes, and some subsequent research, Franz Farber, Daniel, Roland Kurz, and some of their colleagues had started to work on bringing text search techniques to analyzing structured data in-memory in their text search engine, Trex. I was thinking about next-generation database technology in those days, and so we met and a long, deep friendship was formed. A friendship that would lead to many wonderful endeavors, including Hana, but also many deep lessons in transformations, in what it takes to make transformations happen, and the culture and values that we inhabit, that we exhibit, and that we learn along the way. In the Trex days, Franz was the architect, the quintessential “What” leader, the inspiring builder, Roland dealt with people and administration, and Daniel was the executioner, the doer, an extraordinary combination of a deeply accurate sense of where things are no matter how grim, and yet an unyielding, unflinching resolve to achieve impossible goals. He would simultaneously hold in his head the worry, the detail, of the ground reality, as well as the undeterred confidence and clarity that we would achieve the objectives. He and Judith, recently married, had just become parents then, and yet Daniel was able to carry out the extraordinary tasks of being a manager in new, alien, endeavors inside a large company. The lights in the Trex and later Hana offices used to routinely be on, late into evenings, when everything around was long dark. The hallways used to often have the crackle of children playing around while their parents worked, there was much laughter, yelling, a deeply entrepreneurial spirit. In the years that followed, Daniel went on to lead the entire Hana development team, to many incredible successes. 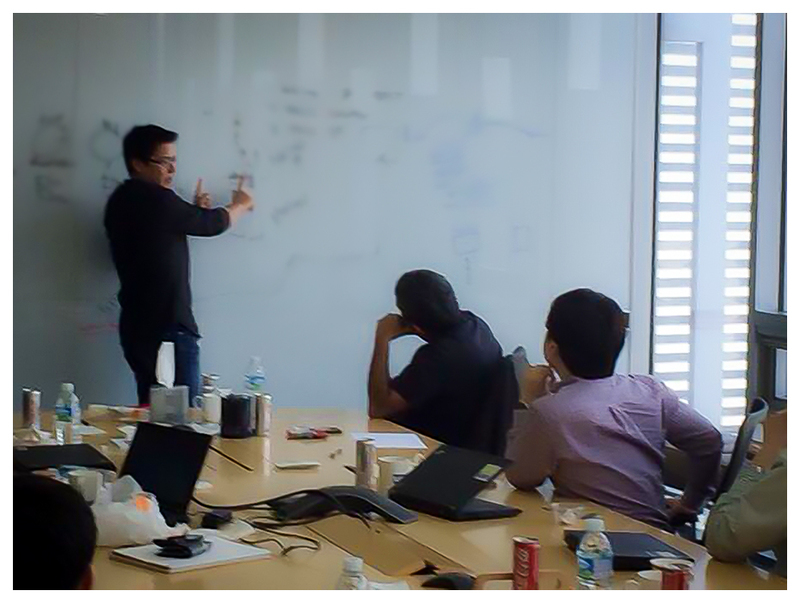 The picture above is from one of my last technical meetings while I was at SAP, in the lab in Korea in 2014, with Daniel speaking passionately about something and me and the other colleagues, listening intently. Again a combination of passion and dreams integrated with objective ground reality. It was this duality, what some call “The Stockdale Paradox”, that defined him. And it was especially this duality that defined him in his fight against cancer. He clearly knew very clearly, and grimly, the toll that his body was taking, and yet he fought and had a sublime smile on him, a grace that was exemplary, and gave energy to those around him, at a time when he needed it the most. The great Indian text, the Bhagavad Gita, as a mentor of mine recently eloquently reminded me, says that we have the rights, the opportunities to do our work, our karma, but not to the fruits thereof. While none of the remarkable achievements of that unforgettable team would have been remotely possible without Daniel’s dedication, hard work and leadership, he deeply understood, and exemplified this belief that we just do our thing, it is upto us to do it as well and as passionately as we can, and then circumstances come together to make great outcomes happen. Transitions, in death and during life, are defining moments, for organisms like us, but also for organizations. We experience this one big journey of our lives, and many journeys during it. And indeed when we think about it, our journeys are all there is. We all are, and are parts of, diverse and multifold journeys, as Feynman said, specks in the universe, universes within us. And if we are fortunate, we get to be parts of great, purposeful journeys, ones that move us, and move us all forward. Finding great problems, great missions to work on, inspiring teams to give their best to these, keeping grand dreams, big ambitions in our minds, and yet our feet firmly on the ground as we move forward, I’ve learnt is what all great journeys, and great humans, are made of.